The Lord has come, through the incarnation of Christ, and He shall return once more to finally completely usher in His eternal Kingdom. Find the wisdom that never changes with the thoughts on Proverbs found at Proverbial Thought! So, almost three and a half years ago I wrote about Global Warming, and the aspect of God’s wrath being poured out on sinful humanity toward the end of the world. This post is looking at things from a slightly different perspective. Recently, the International Panel on Climate Change released their updated report on the state of the climate. The US and France were quick to lead the charge on the importance of acting on this information and fighting global warming quickly. The main argument is that humans are the main culprit for catastrophic global climate change. They are right. Humanity caused the climate to change. 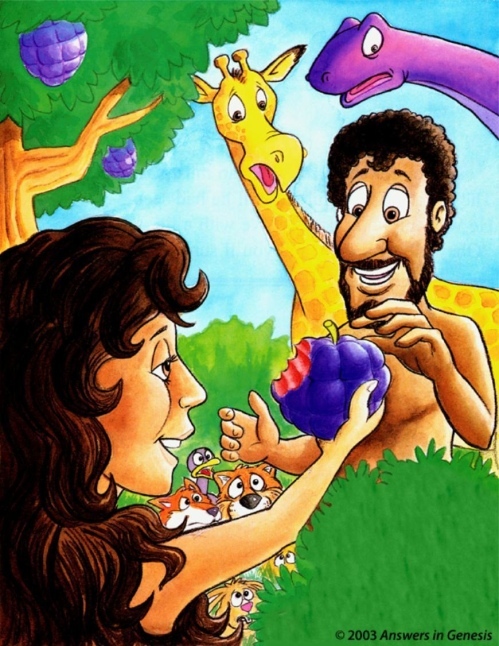 The only thing Adam (and through him, Eve) was told not to do was eat the fruit from the tree of the knowledge of good and evil (2:17). The Bible goes on to tell us that the perfect climate and fertile ground would become more hostile and unwieldy. Here is where the good news comes in. We messed it all up, and each of us is responsible for our sin. This is why we will see God’s wrath poured out (as mentioned in my previous post). Therefore, just as sin entered the world through one man, and death through sin, and in this way death came to all people, because all sinned . . . For if, by the trespass of the one man, death reigned through that one man, how much more will those who receive God’s abundant provision of grace and of the gift of righteousness reign in life through the one man, Jesus Christ! Get to know wisdom better through some of the words at Proverbial Thought. And as they still went on and talked, behold, chariots of fire and horses of fire separated the two of them. And Elijah went up by a whirlwind into heaven. And Elisha saw it and he cried, “My father, my father! The chariots of Israel and its horsemen!” And he saw him no more. Redeem your mind and find some wisdom over at Proverbial Thought! And then Moses, the one who led the Israelites to redemption out of Egypt, was coming. And all because Jesus, the One who would redeem Israel and all who would believe in Him from their sins, was coming. The United States aborts between 3,000-4,000 babies every day. This year (as of June 16) about 500,000 abortions have been performed in the US. Since the ruling of Roe v. Wade in 1973, there have been almost 57 million abortions in the US. There have been over 100,000 abortions today globally. There have been nearly 19 million abortions this year (as of June 16) globally. Is something getting ready to happen? As usual, here is your friendly reminder to head over to Proverbial Thought for your daily dose of wisdom. Last week I discussed expecting the coming Messiah. I am continuing this little series, not from the standpoint of believers, but from the perspective of “outsiders” to the faith. Nobody is completely sure who they were, but the Magi were definitely by our modern definition astrologers (study the stars, planets, and other such heavenly bodies to better understand the present and future) and possibly Zoroastrians. This could make sense, as Zoroastrians, like the Jews, are monotheists (yes, they still exist), worshiping only one god. In fact, they may be willing to accept that the Jews worship this god in their own fashion. Regardless, they would have had reason to believe that this “king of the Jews” could indeed be Savior of the world, for Zoroastrians also believe one is coming. While they were watching the stars, they saw this one star that, according to all of the various alignments and timing, meant someone in the area of Palestine of the Jewish people was being born as a king. This king was worthy of their worship. What is amazing is that foreigners knew the Jewish Messiah was coming. How many in Israel knew? Some were expecting, as discussed last week, but none knew until He was right in front of them or someone (such as angels?) told them. How is it that the very people who should have seen the Savior of the world coming missed it, but outsiders recognized the times for what they were? Part of it is that most of the Jews had an idea of what the Messiah should look like, and he was not exactly what they envisioned. These Magi, however, were open to the fact that the Creator of everything could work however He wanted. They could see what most others could not, because they expected God to move in unusual ways. Many Jewish leaders ended up getting hit over the head with their own sins and obtuseness. They had all the answers, but could not see the Rock of Truth flying straight at them. Would we have known Jesus was coming? Are we paying attention to our times? Can we judge (with the help of the Holy Spirit, especially) whether Jesus may be coming soon? Think on this (keeping in mind this is simply food for thought): If many religions and even atheists are expecting a highly probable (some would say definite) end to life as we know it, perhaps even to our planet, why is it so weird that some Christians expect the soon return of Christ to this world? What are you looking at? What are you watching? Or are you going to be surprised by God coming and ruining your plans? I would like, firstly, to offer a reminder to check out Proverbial Thought. Wisdom is always helpful, and especially so during a busy holiday season! I have fallen in with several different crowds in my life. Before this gets out of hand, I mean within Christianity. One of those crowds with which my history is long and varied is those expecting the soon return of Jesus Christ. I recently have been hearing people, due largely to last year’s predictions of the rapture and the coming of the “Mayan prediction” of December 21, 2012, being the end of the world (bunk), mocking people who expect His soon coming. These people doing the mocking are mostly Christian. Is it really so silly? There was another time when many people were calling for the coming of the Savior, and many others mocked them. It was easy with so many other religions and pseudo-Saviors popping up to save the day … and failing. Some expecting the Messiah claimed God had revealed to them that His Messiah was coming soon. Others were astute enough from years of dedicated prayer and fasting to recognize what was going on around them. And those few were right. The story above relates how to elderly people were eagerly waiting for the coming Messiah. When others may have laughed, they knew beyond a shadow of a doubt that He was coming. I am pretty sure, however, that few laughed. In fact, when we consider the thousands that later followed Jesus, there were many people who expected a Messiah. In this story, it says Anna “spoke about the child to all who were looking forward to the redemption of Jerusalem.” Do you realize that many of those who heard this may not have even been alive, let alone remembered this, by the time Jesus began His ministry 30 years later?! Many people today eagerly await the returning King of kings. This is good! Sure, there are problems with some people claiming to know the date. Some people flat-out deny Christ’s return. Some people say it is not really that important. Sometimes, we disregard a truth because of where it comes from. Joseph and Mary easily could have disregarded what was being said about their infant son, but I am pretty sure their dreams and visions from only the previous six to nine months were vividly fresh in their minds. They were seeing an impossible baby being born to verify the visions and dreams! These prophecies were becoming run of the mill for them, by now! Perhaps that is our problem. How many Christians today regularly fast and pray? How often do you set aside time for seeking God through prayer and listening for Him? Jesus could be coming this month (even as you read this). How could we know if we are not daily seeking time to talk with God. We do not believe in miracles or spiritual gifts, so why should we expect His return to be soon. Join with others in following my example, brothers, and take note of those who live according to the pattern we gave you. For, as I have often told you before and now say again even with tears, many live as enemies of the cross of Christ. Their destiny is destruction, their god is their stomach, and their glory is in their shame. Their mind is on earthly things. But our citizenship is in heaven. And we eagerly await a Savior from there, the Lord Jesus Christ, who, by the power that enables him to bring everything under his control, will transform our lowly bodies so that they will be like his glorious body. Therefore, my brothers, you whom I love and long for, my joy and crown, that is how you should stand firm in the Lord, dear friends! This Christmas, and always, expect the Messiah to return soon. He may not, but we should live as though He is coming tonight but may wait another thousand years. Of course, we must praise Him always!